Respect is generally earned, but sometimes — even then — it’s not received. That’s the situation for perennial forage crops, at least in the eyes of many federal and state decision makers. It’s also the reason why a group of university forage researchers and extension specialists from across the United States authored the article on pages 18 and 19. For many of our readers, the article will be like “preaching to the choir.” Even so, the points made will be enlightening as to the dire lack of support that forage crops currently endure. Further, it may also offer some ammunition to present to your state’s administrative decision makers who have a role in supporting research or hiring personnel. Perhaps I’m over sensitive to this issue, but I’m one of those who forged a career in forage crops largely because of a university professor who I took a class from during my undergraduate days at Iowa State University. 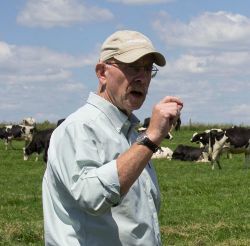 Once in graduate school and knowing my budding interest in forage crops and extension work, the state’s forage extension specialist, Steve Barnhart, would sometimes drag me along to educational events and meetings he was involved with. Such people do make a difference in young people’s lives. It’s going to be these young adults who will need to populate the university and private company forage hallways in the future. Given current circumstances, who will be left to help get them there? These days, Iowa doesn’t even have a forage extension specialist, though there are nearly a million beef cows and 220,000 dairy cows in the state. Similar situations exist in other states, and yours may be added if some action isn’t taken. Forage crops generate dollars for those who choose to harvest and utilize them. Alfalfa alone is the third most valuable crop produced in the U.S. Throw in grasslands and annual forage crops and it would seem that research and educational resources would be easy to come by. They’re not. I have been on a lot of farms and ranches in my lifetime. It’s here where the conversion of forage fiber to milk and meat is alive and well. I wish I had a dollar for every time I was told some variation of “I owe all of our success to the forages (or pastures).” On the farm, forage crops matter and make money in ways not accounted for on USDA ledgers. Money is one thing, but environmental benefits also come into play; every person, rural or not, reaps the rewards of having perennial forage crops on the landscape. There simply is no better way to protect and enhance the quality of soils than with forages. Why isn’t this benefit to the human race valued as it should be with personnel and research dollars? To be sure, there are shining examples of states that do support forage extension and research. But that list is small and it’s getting smaller. Collectively, we all need to do our part to reverse the trend and ensure a future of forage respect. This article appeared in the August/September 2018 issue of Hay & Forage Grower on page 4.